The idea of a “smash cake” is getting more and more popular these days. 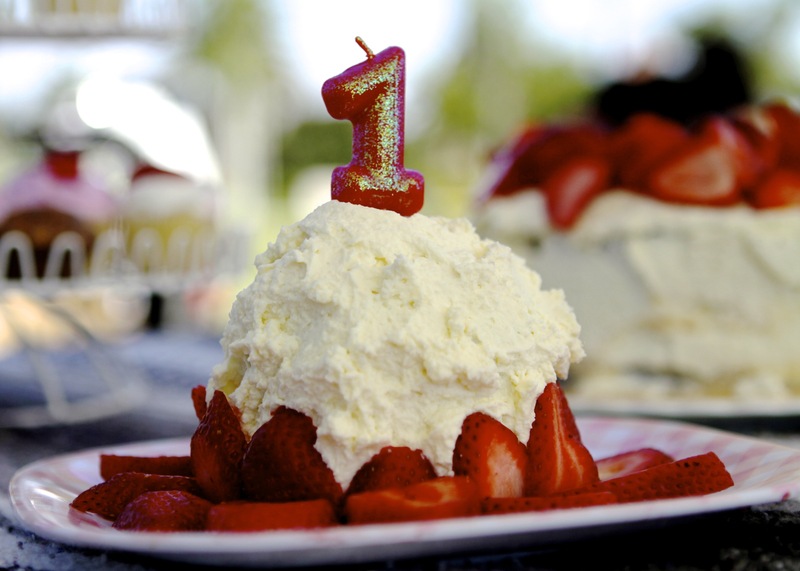 It is generally a small cake given to a one-year-old at his or her party. 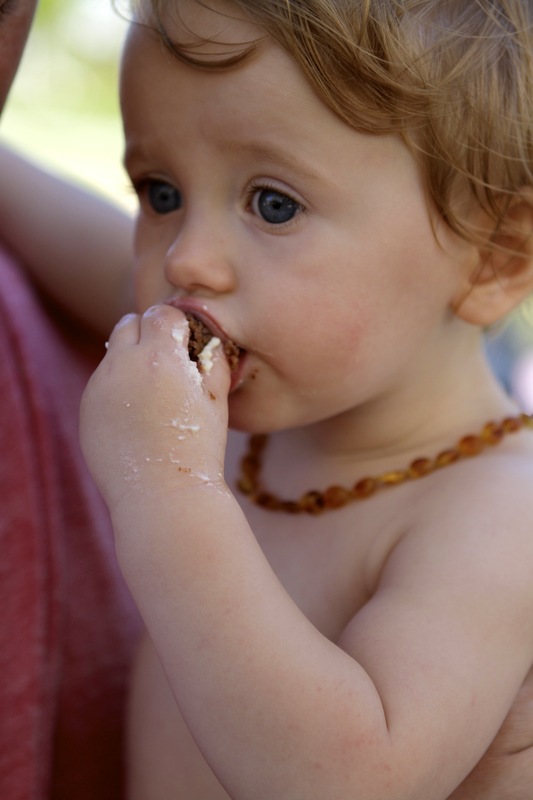 Babies can dive into it and make a mess, while a larger cake is reserved for the rest of the party. Some parents also find this an opportunity to make baby’s cake more healthy. Since I attempted a tres leches cake for our baby’s first birthday party, I saw exactly how much sugar went into it and wanted to give her something a little healthier and developed this healthy banana smash cake. This banana smash cake will not be winning any beauty contests. If you would like to find a tutorial on decorating a gorgeous smash cake, try this one. However, I couldn’t find any decent, healthy recipes for cake for a one-year-old that looked like they tasted good. Our baby has had wheat and now whole eggs, so my main concern was reducing the sugar. Since she loves bananas, I decided to make something up, based on my banana bread and a basic banana cake. Feel free to substitute a gluten-free flour mix. You can also try using flax or chia seeds in place of the eggs. It was also important to me to avoid any artificial dyes or coloring, as well as artificial ingredients in general. A lot of “frosting” is partially hydrogenated shortening plus sugar and food coloring. I tried whipping up a can of coconut milk, which was popular on pinterest, but frankly, it tasted like a can. I decided there was nothing wrong with a little bit of organic cream, especially since whole fat yogurt is one of her staples. The most challenging part of making a mini cake is simply finding mini pans. Before you go out and buy something, look and see what you might have at home. I had oven safe ramekins that looked about the right size. I also had 4″ tart pans that I thought could make little “layers” for a two layer cake. After filling up the ramekin and pans, I had enough batter to fill up a pan of one dozen mini muffins. I figured Baby would be able to share the healthy treats with her baby friends. And with the mini muffins the three of us were able to sample the cake straight from the oven (it really was best warm). A healthy banana cake, low in sugar and free of artificial ingredients or coloring, ideal for a baby's first birthday. Sift dry ingredients (the first four ingredients) together. In a mixer, cream the oil and sugar until fluffy. (Note: coconut oil does not get as fluffy as butter.) Add the egg and vanilla and beat until light. Gently stir in the bananas, alternating with the dry ingredients and the kefir or yogurt. Pour into the prepared pans. Bake until a toothpick inserted into the center comes out clean. Mini muffins and mini tart pans: 12 minutes. Ramekin: 35-40 minutes. To make the frosting: Whip cream, vanilla and sugar in a mixer with a wire attachment until stiff peaks form. Let baby taste from the bowl. Decorate the cake rustic style or smooth out and decorate with piping. Top with a candle and baby's favorite fruit. Variation: One of Baby’s friends turned one this past weekend and her mom made an adorable caterpillar cake for her Very Hungry Caterpillar themed party. The head was the baby’s smash cake and the body was cupcakes for the rest of the party. Update: Try Baby Bird’s Pumpkin Smash Cake for a gluten-free option! This entry was posted in Dessert, Entertaining, Food, Healthy Recipes, Homemade Baby Food, Recipes for the Whole Family and tagged baby's first, healthy baby cake, healthy smash cake, smash cake. Bookmark the permalink. is there a way to whip the cream by hand or with a immersion blender?? Sure. Whipping by hand might take a while but an immersion blender or hand held blender will work fine. I used 2- 2″ H x 4″ D circular springform pans to bake this for my baby. In my oven (a 2016 KitchenAid KEBS279BSS01) it took nearly 50 minutes to complete the baking at 350f. I live less than 200′ above sea level so that wasn’t a factor. I’m wondering: what size were your tarte pans?